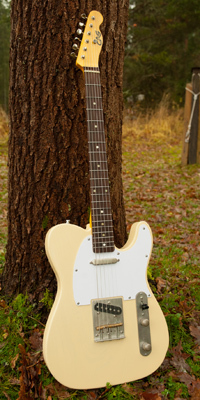 The elegant simplicity of a Telecaster has really appealed to me for quite some time now. I had already received one very special, cosmetically over-the-top Telecaster from my go-to luthier Pekka Mäkinen from GAS Guitarworks a year earlier. As I was gigging regularly at the time and that guitar was for the most part residing inside the touring vehicle, I kind of needed another Tele for home and hobby use. Out of this sheer necessity I once again reached Pekka who had by coincidence just received a remarkable pile of high-quality lightweight swamp ash and he was more than eager to help me again. 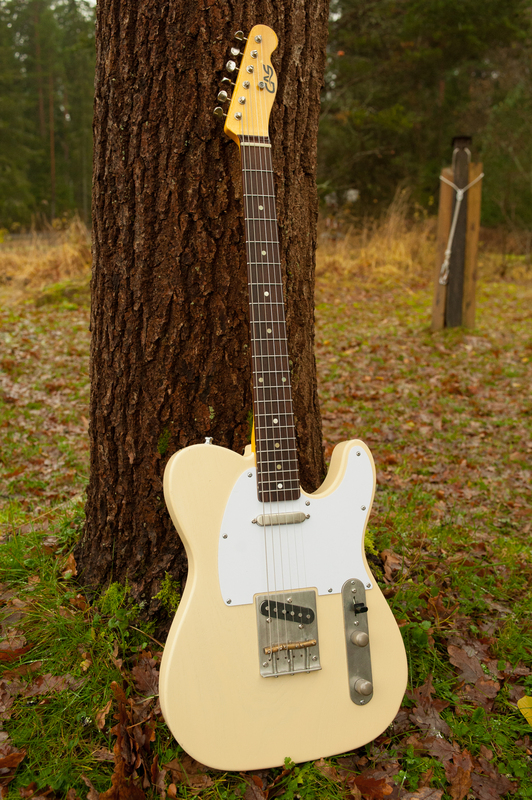 This time we took a totally different route: instead of a sparkling and shiny bling thing I wanted a super-simple, just-your-basic-nuts-and-bolts type of a Telecaster that resembles the best workhorse guitars from the early 50's when the model was first released. Because of this I chose the classic Butterscotch Vintage finish and a white pickguard. Also as the previously built Tele had a one-piece maple neck+fretboard, I wanted "the other one" this time, so a rosewood fretboard was chosen - and I think it looks stunning! The pickups on this guitar are made in-house. There's one little change to the classic pickup configuration: the neck pickup has a coil that's taller than a regular Telecaster neck pickup has. What this does is it makes the tone somewhat similar to that of a Stratocaster neck pickup: lots of definition and clarity. It still sounds like a Telecaster, no worries. After the guitar was put together, Pekka asked if he could try to relic it a bit - nothing too radical, but some signs of use: little scratches, dings and nice patina on the hardware. I gave him free hands and as I saw the results, I think he did a great job - not that I'd really expected anything else.